Our neighborhood pool is nearby our house, so instead of driving, I put the kids in the double stroller loaded up with towels, toys, snacks, drinks, changes of clothes, hats, sunscreen, etc and then I push the whole 100lb+ thing uphill to the pool. 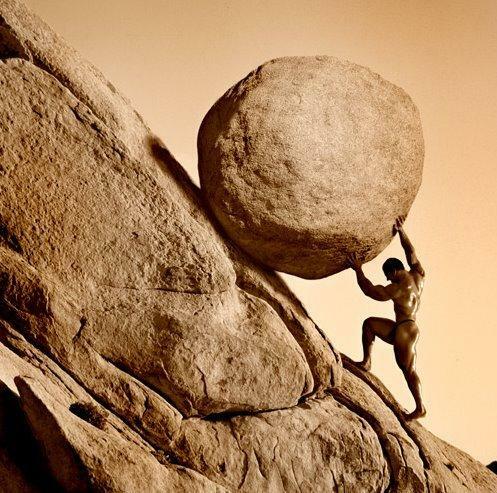 I look like Sisyphus. By the time we get there, I’m drenched in sweat. I think I did two things here. The first thing I did was set a terrible example for my children. The second thing I did was get that punk kid to show me some respect. I’d like to think because of me, he will turn into a gracious gentleman who will treat women with kindness for the rest of his life. Unfortunately, he will have to put up with my mouthy, ball-busting daughters who will undoubtedly take after me. Hopefully I can remedy this before they really start remembering stuff. When is that again? When parents talk about how bad their child is or say they’re in the “terrible twos” right in front of the kid, it makes me uncomfortable. It’s like if my husband turned to his buddy and was like, “Sorry about her, it’s that time of the month.” I’d be like, wow, really? Right in front of me? Wait til you see how bad I’m gonna act now that I know you expect it! “Grandma Phyllis pooped her pants and it’s EVERYWHERE!” #GoodThingShesCute” with a picture of Grandma Phyllis grinning in her own feces. Have you been a jerky parent? Do you have a parenting grievance to air? Tell me! I hate milestone bragging in general. Who cares who walks first, eats solid food first, or reads first? Everyone learns to walk. Everyone learns to eat. Everyone learns to read. And I don’t even have kids yet! Woof. That’s a REALLY good one! The potty training thing is such a huge topic of conversation among first-time moms and by the second one you’re like, well I guess they’ll let me know when their ready!